It happens every year. 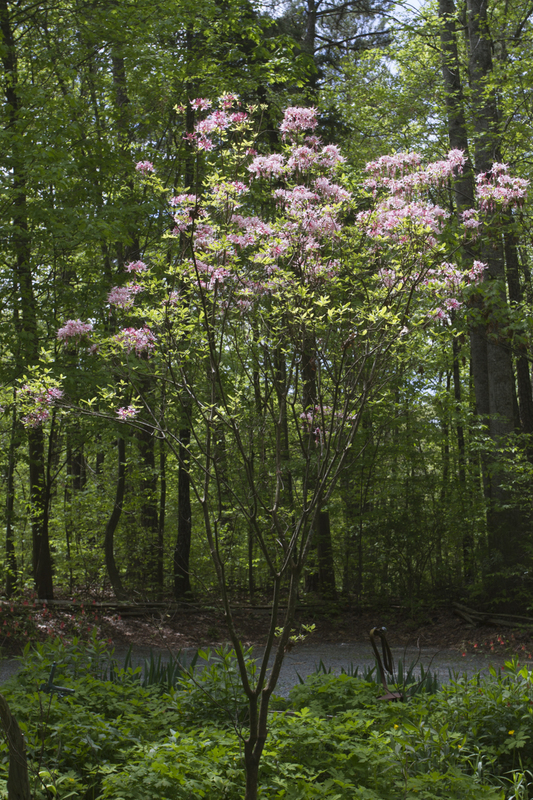 Things start changing so fast in the spring woods that I can’t quite keep up. There are also the chores associated with spring – fixing up stuff around the house, getting the garden prepped and planted, and so many others we all make for ourselves, too numerous to mention. But, it is what is speeding by outside my window that keeps me wanting to stop what I am doing and take note….spring is whooshing by and will soon be over and I will have missed something for gosh sakes. And that is probably the origin of the yard tour. I’m guessing it started one spring when I just felt it was all whizzing by without notice. 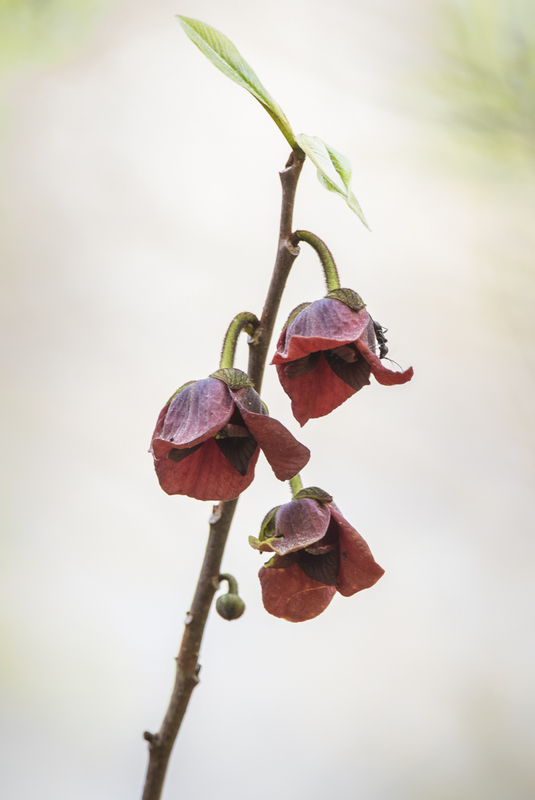 So now, as often as possible, I take the camera or a notebook and slowly walk around the yard, observing what is occurring, taking note of what is blooming, stopping to watch something unusual and ponder. It is a good tradition, I think I’ll keep it. 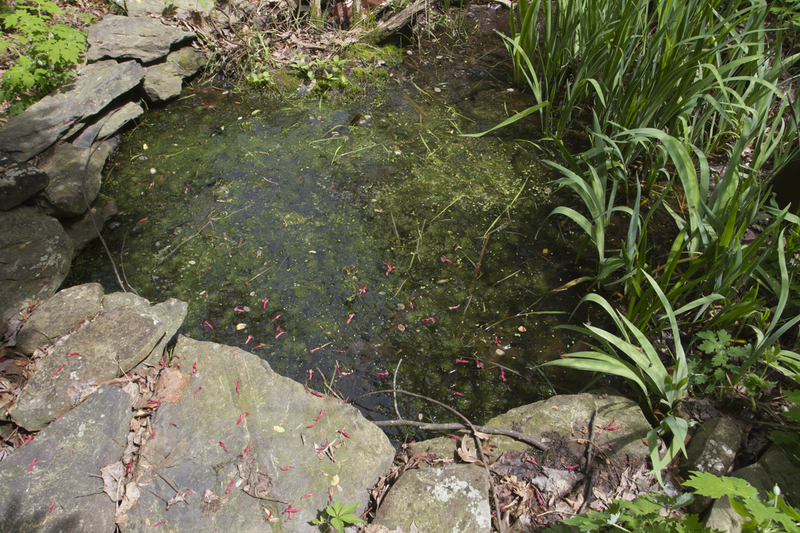 So, this is simply a yard tour post…things that I noticed this weekend, things whooshing by, but appreciated by a simple slow walk around the yard. Every spring is the only spring – a perpetual astonishment. The astonishment starts slowly, almost imperceptibly. The temperatures in this part of the world tease, and then take away the warmth, only to bring it back in a day or two. But the woods are more predictable than the thermometer. One of the first hints is that reddish tinge in the trees you see, usually while driving somewhere. The Red Maple flowers are amongst our earliest, and they signal the true change in season. 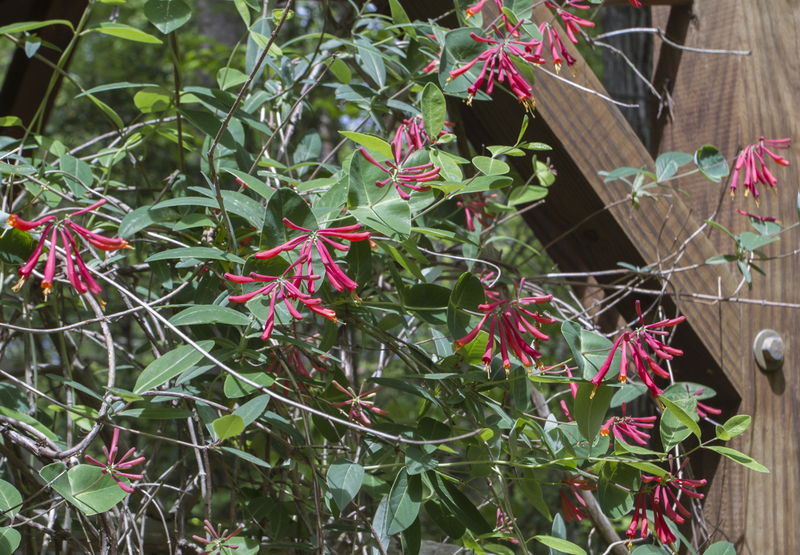 The tiny red flowers lay scattered here in the yard now, mostly done for this year. But they awaken the spring consciousness in me, and I start to notice the other changes happening all around. 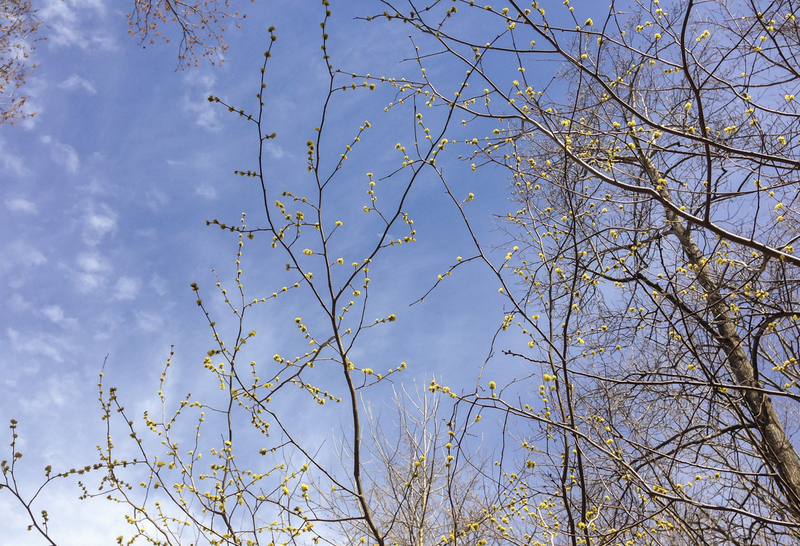 The tiny yellow puffs of flowers of the Spicebush, Lindera benzoin, appeared more than a week ago, a couple of weeks before the first leaves of this naive shrub. 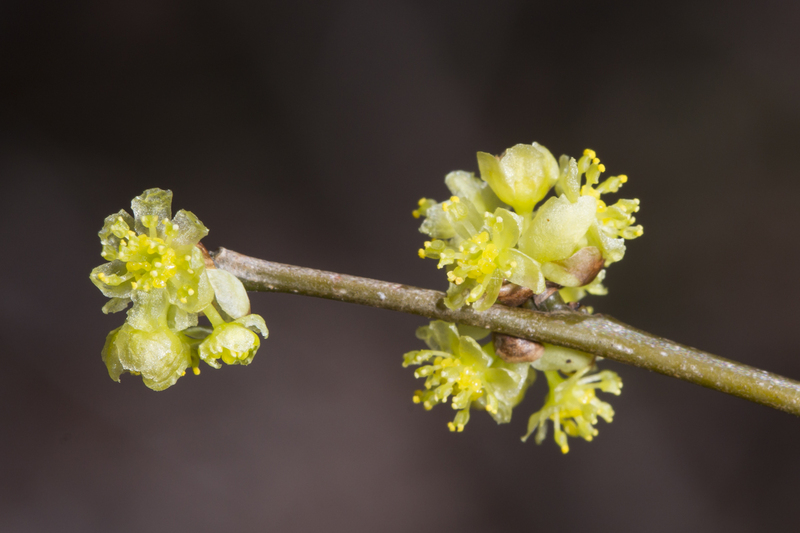 Spicebush can be found throughout our region, especially in the fertile soils along rivers and streams. 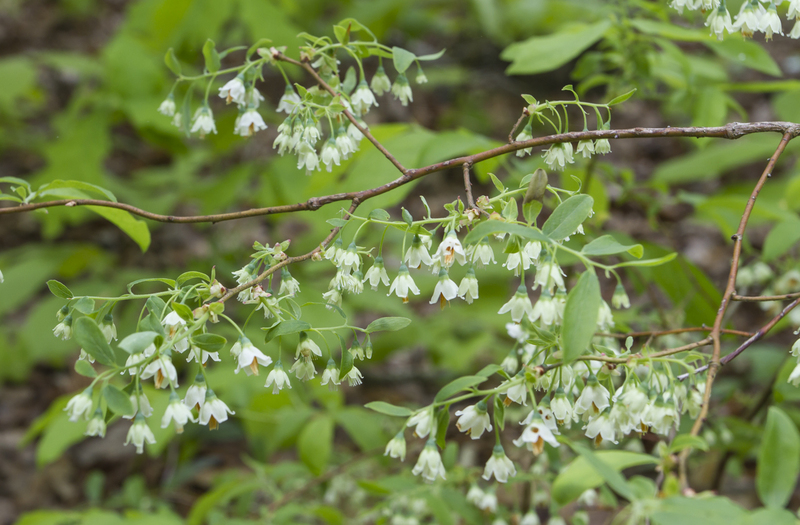 Male and female flowers occur on separate shrubs, with only the female plants producing the bright red berries in Fall. Birds relish the fruit, and, dried and pulverized, the drupes were once commonly used as a substitute for allspice. 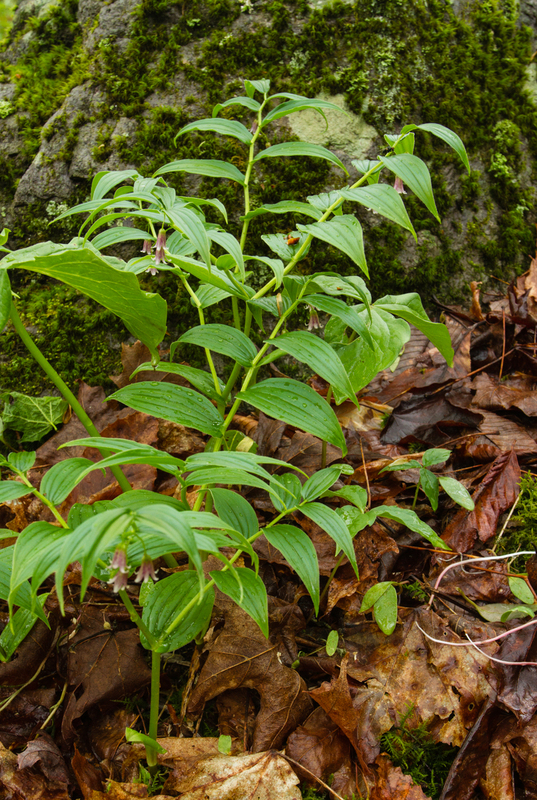 The twig bark and leaves can be brewed into a tasty tea that purportedly has medicinal properties. But I love this plant for another reason – one of its associates. The Spicebush Swallowtail butterfly lays its eggs on this shrub and on the leaves of Sassafras. 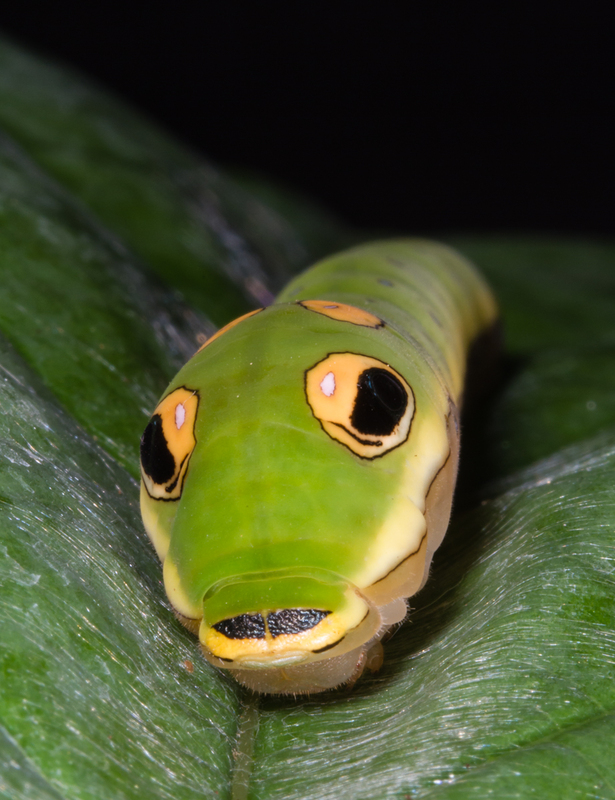 This beguiling bug is one of my favorite caterpillars, complete with large fake eye spots, and a habit of folding the leaves to make a shelter, making it one of the easier caterpillars to find each Fall to delight visitors at the museum’s annual BugFest event. 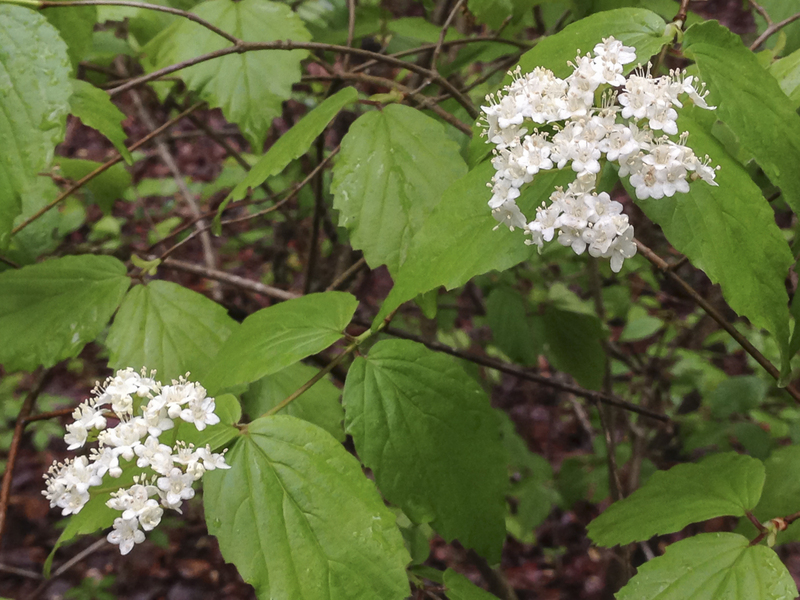 On our stroll last weekend, I was surprised to see very few of these supposedly deer resistant shrubs down in the creek bottom. It looks like they have been heavily browsed. 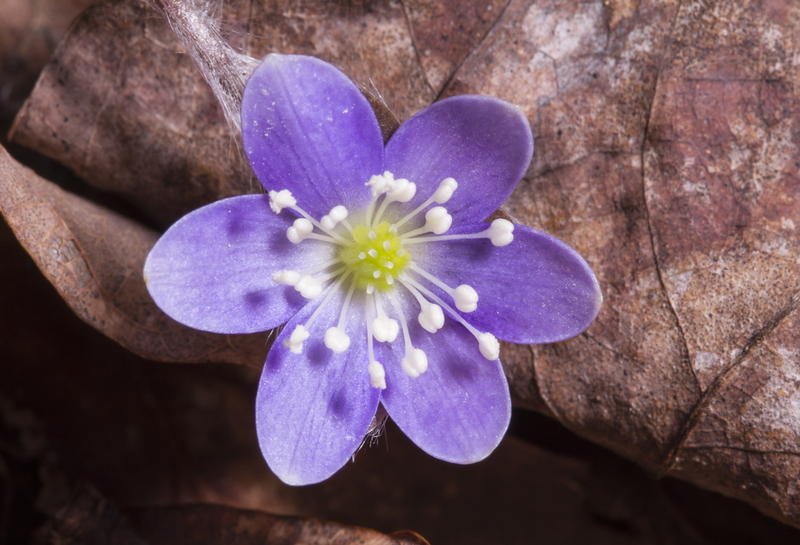 But, to my delight, we did find a few Hepatica (Hepatica obtusa var. 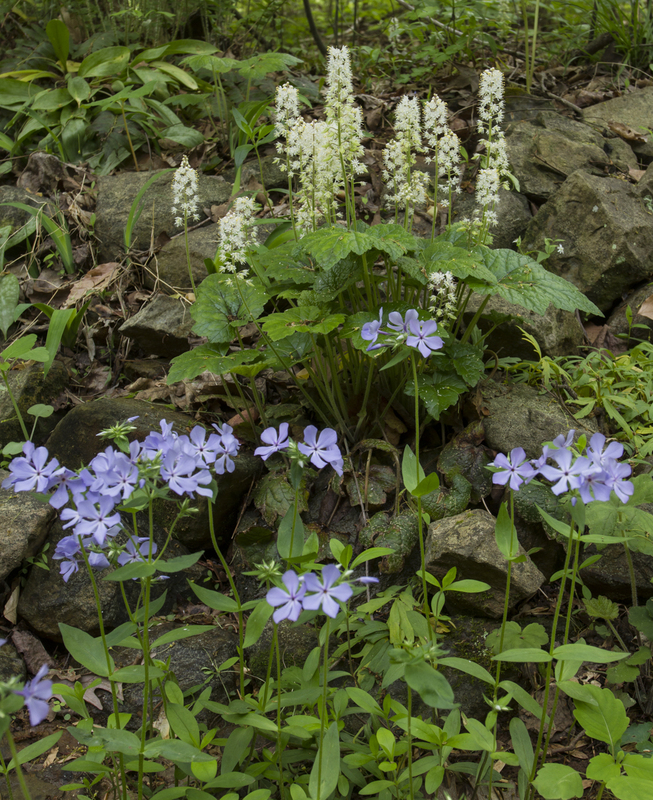 nobilis or Hepatica americana) flowers in bloom. 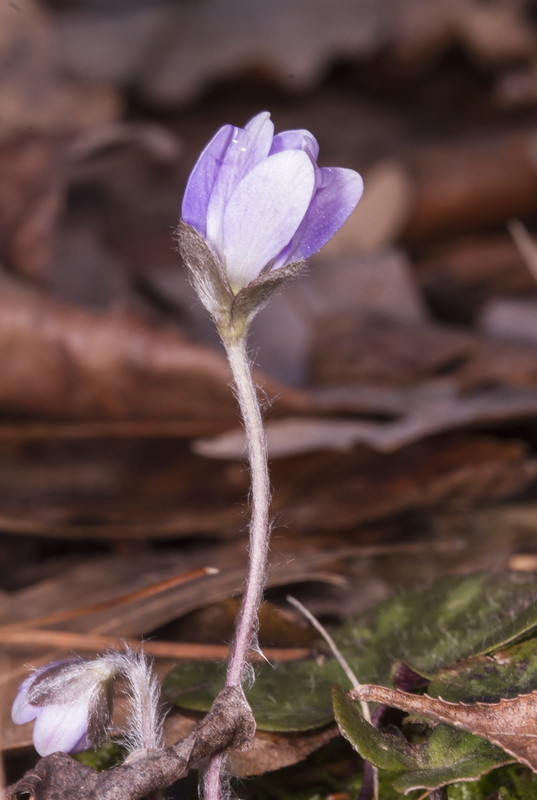 These tiny bluish-purple flowers are amongst the earliest of the spring ephemerals, barely poking their blossoms above the leaf litter. We probably found a half dozen flowers in our walk last weekend, so at least a few have survived the deer. 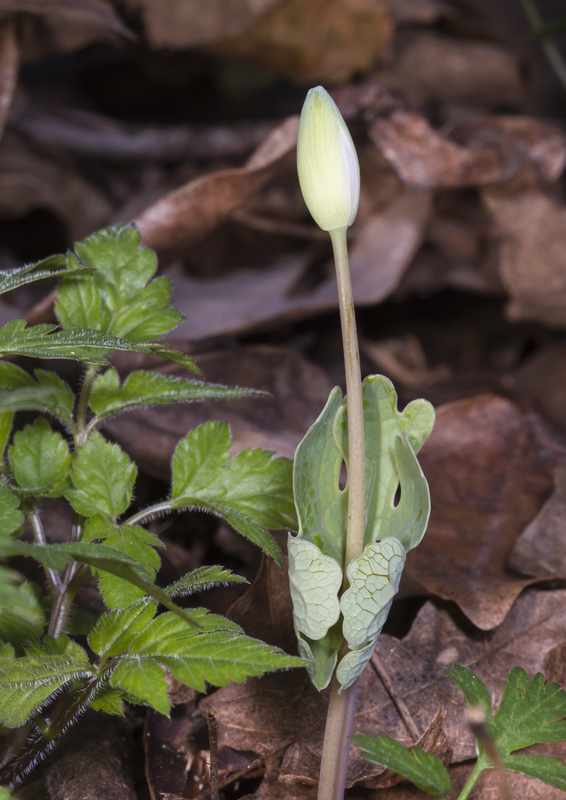 A neighbor posted something on our list serve about Bloodroot (Sanguinaria canadensis) being in bloom this week. 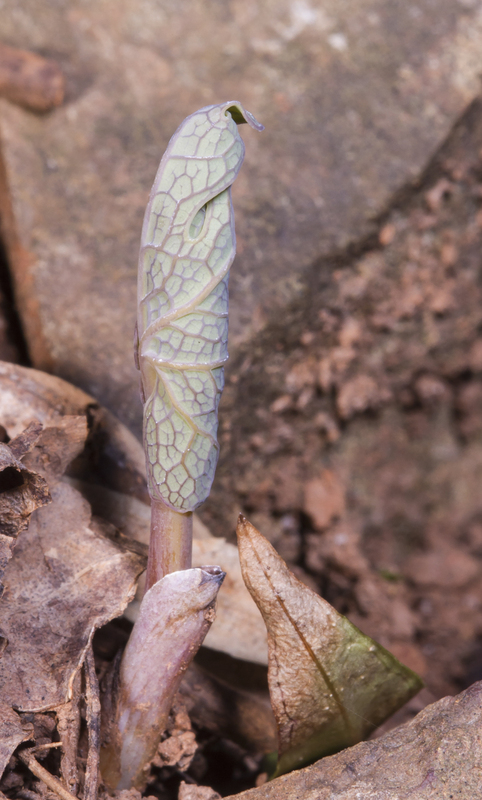 We did not see any leaves or flowers on our walk last weekend, but I did find a couple inside the deer fence yesterday. The single basal leaf pokes out of the ground tightly furled like a tiny textured flag wrapped around a pole. 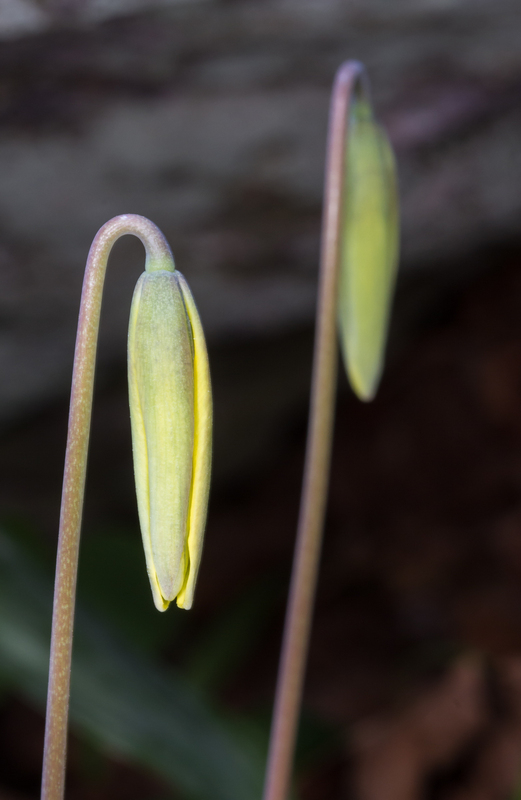 Each single flower stalk emerges wrapped in a single leaf. When the flower blooms, the leaf unfurls. The short-lived flowers remained tightly closed yesterday, perhaps awaiting a sunny day before opening up to potential pollinators. 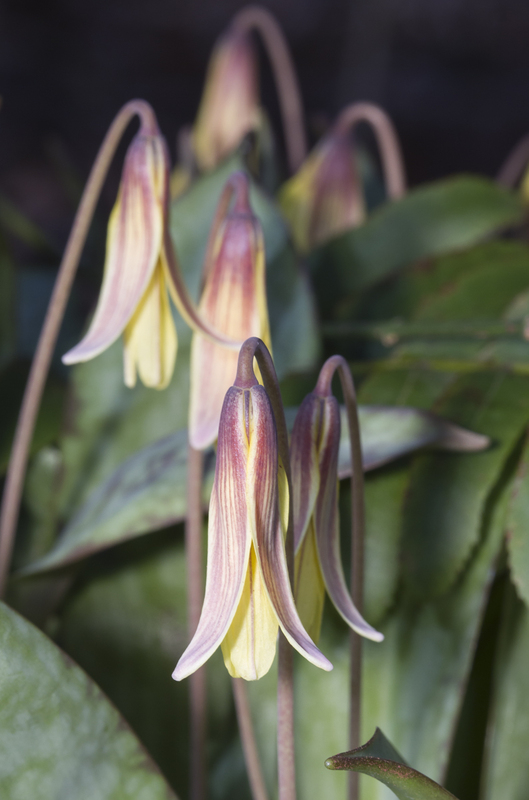 One of my favorite spring ephemerals is the Trout Lily (also called Dimpled Trout Lily), Erythronium umbilicatum. 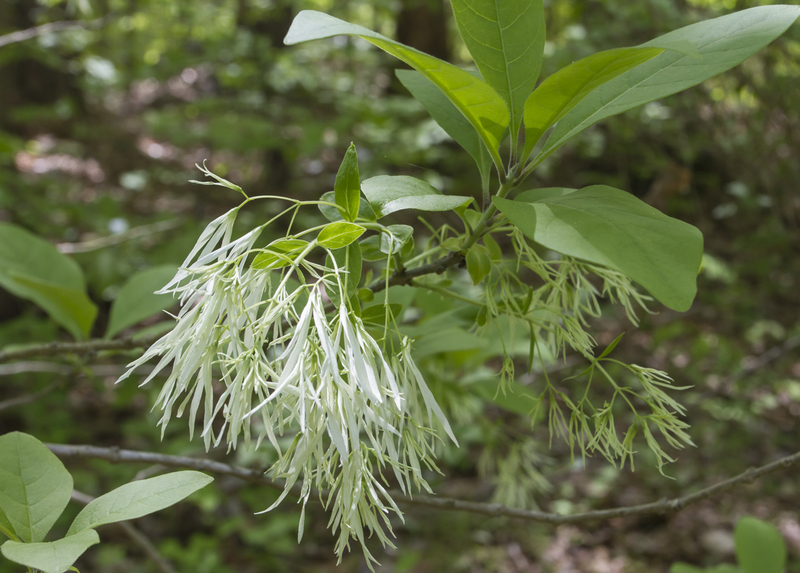 Blooming in early to mid-March, it can form dense colonies in areas like Eno River State Park and Johnston Mill Nature Preserve. 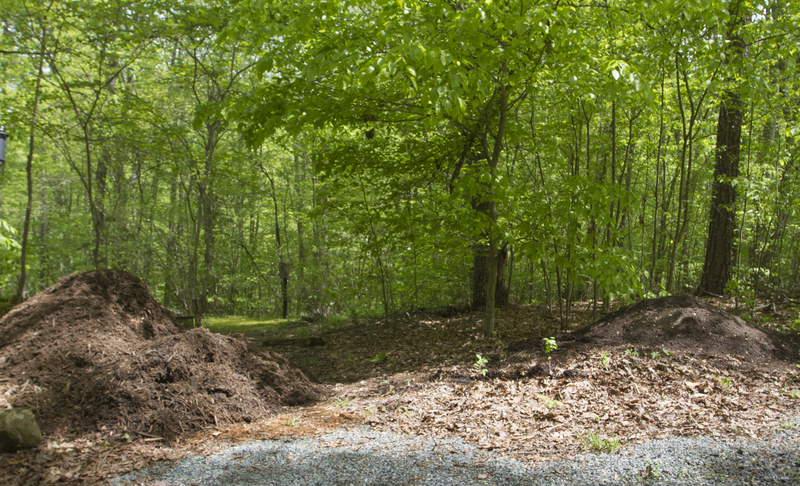 There are a few plants that were transplanted into this yard during a plant rescue organized by the NC Botanical Garden. These volunteer efforts help rescue plants from a development prior to the bulldozers commencing their work. This is a great way to get plants for your yard and to save a bit of our native flora. 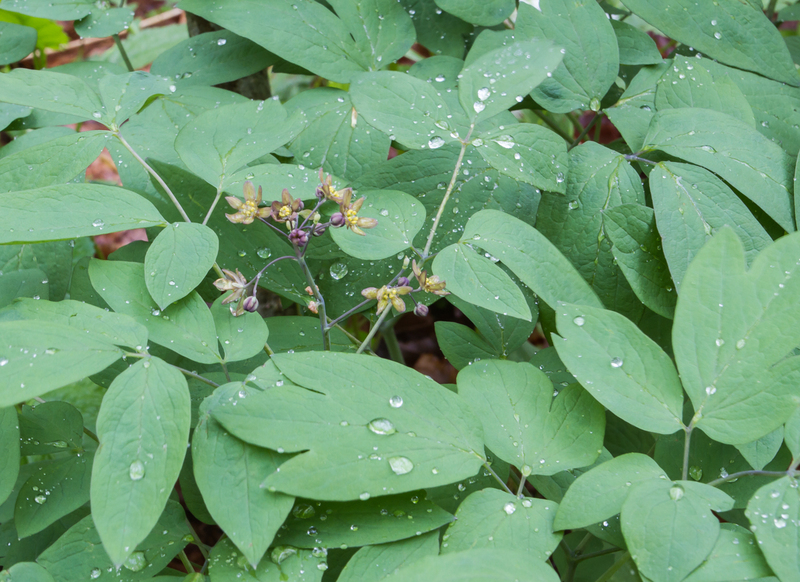 Be sure to get permission from the landowners before doing any plant rescues. 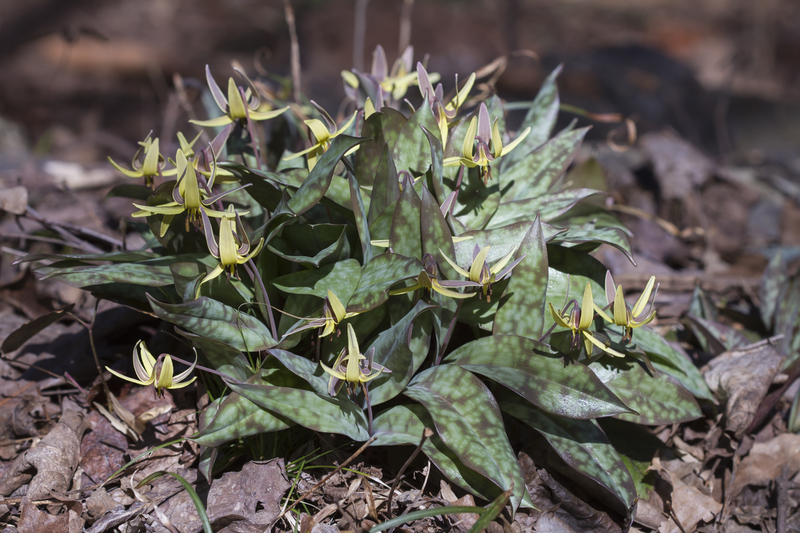 The common name, Trout Lily, comes from the dappled leaves which are said to resemble the skin pattern of a Brook or a Brown Trout. 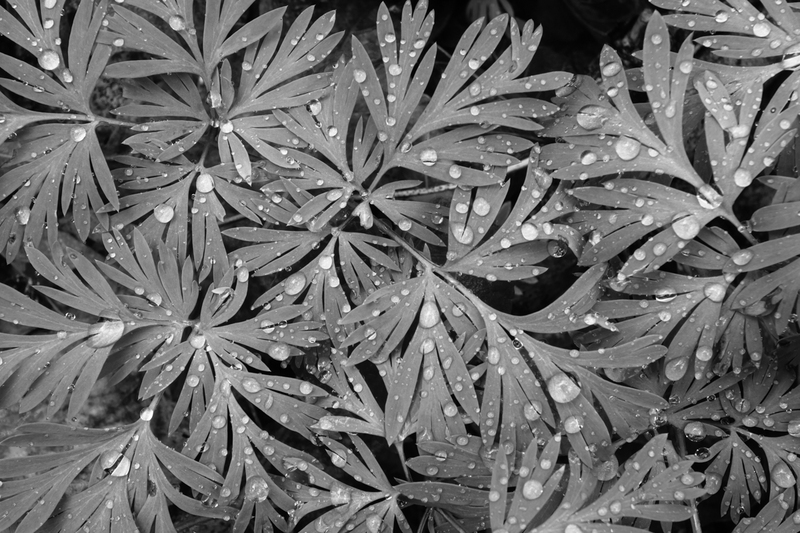 Plants that will not flower have a single leaf, those producing flowers will have two leaves. I enjoy looking down on the flowers to appreciate their pattern. 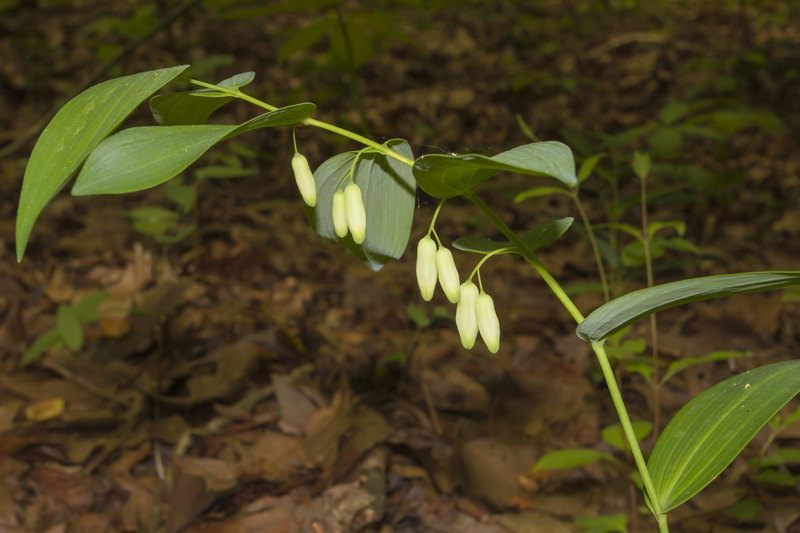 Besides, you really have to almost lay on the ground to get a good photo of a flower due to their drooping habit. 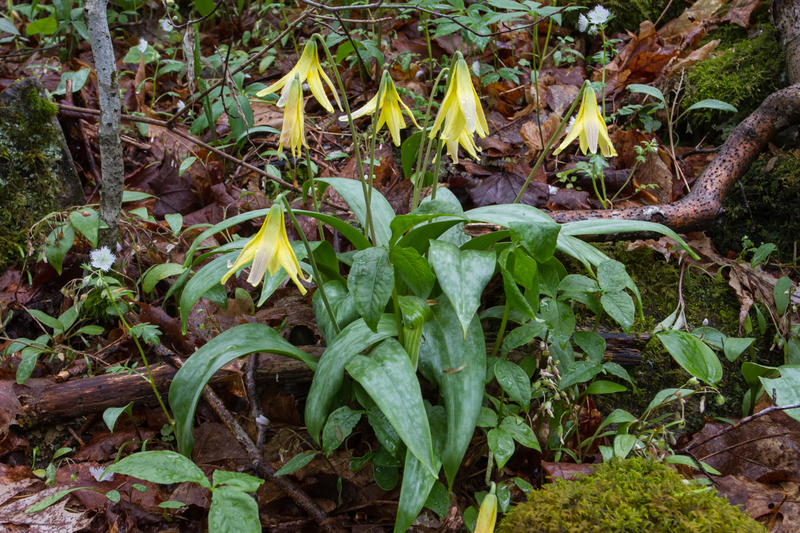 As with many spring flowers, Trout Lilies close each evening and may remain closed on rainy or cloudy days. This probably serves to protect their pollen and have it ready on warm, sunny days, when pollinators are apt to be more active. 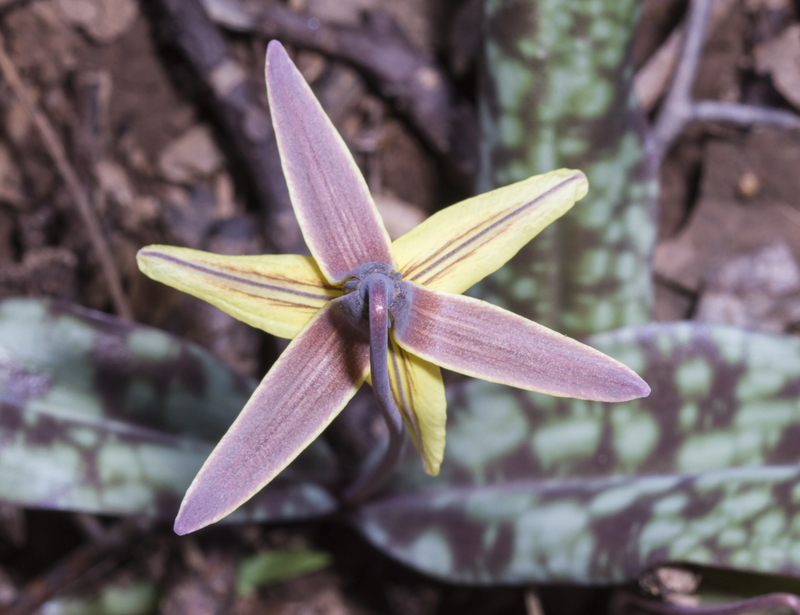 When fully open, the petals and sepals reflex upward, revealing the flower parts hanging beneath. Yesterday, the flowers in the yard remained closed. 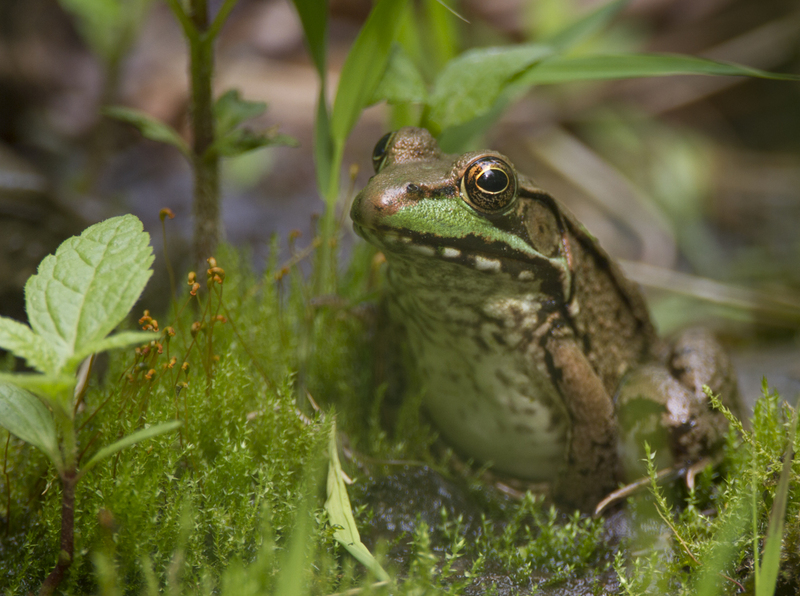 The cool rainy weather may have slowed spring for a bit, but the next few days promise more astonishment. There is a noticeable reddish-pink cast to the twigs of the Redbud trees surrounding the house. Once they bloom, and that curtain is raised, the stage is set for the grand show to begin in earnest. If you get too busy for a day or two, you may miss some of it. Be sure to take some time to look around you these next few weeks, to observe and listen, and enjoy the arrival of the new season. 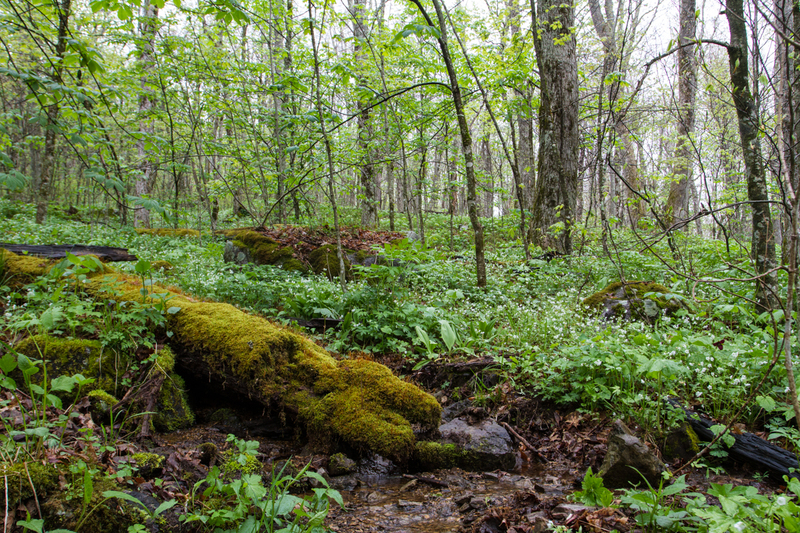 It is truly a magical time to be a woods-watcher. The change in our clocks this past weekend is one of the ways most of us know that spring is on the way in spite of the cold the past few weeks. Another are the first truly warm days like we are now having. 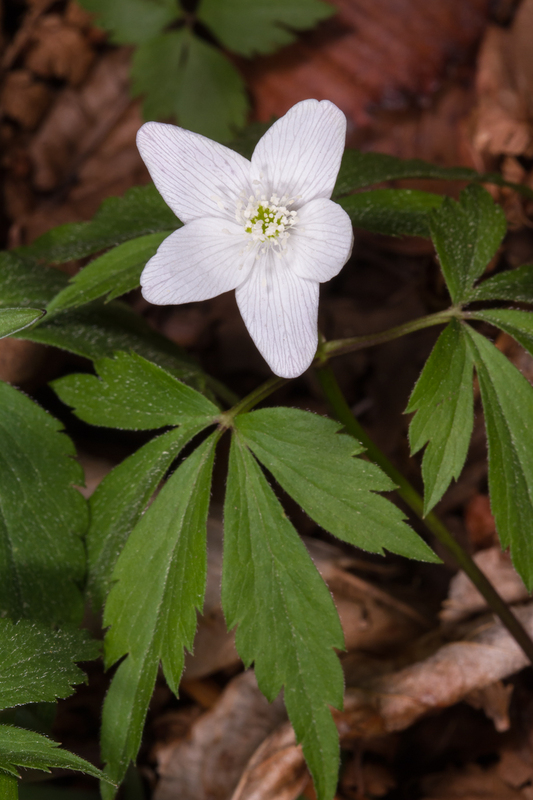 But, for me, I know it is spring when I discover the first wildflowers of the season in our woods. 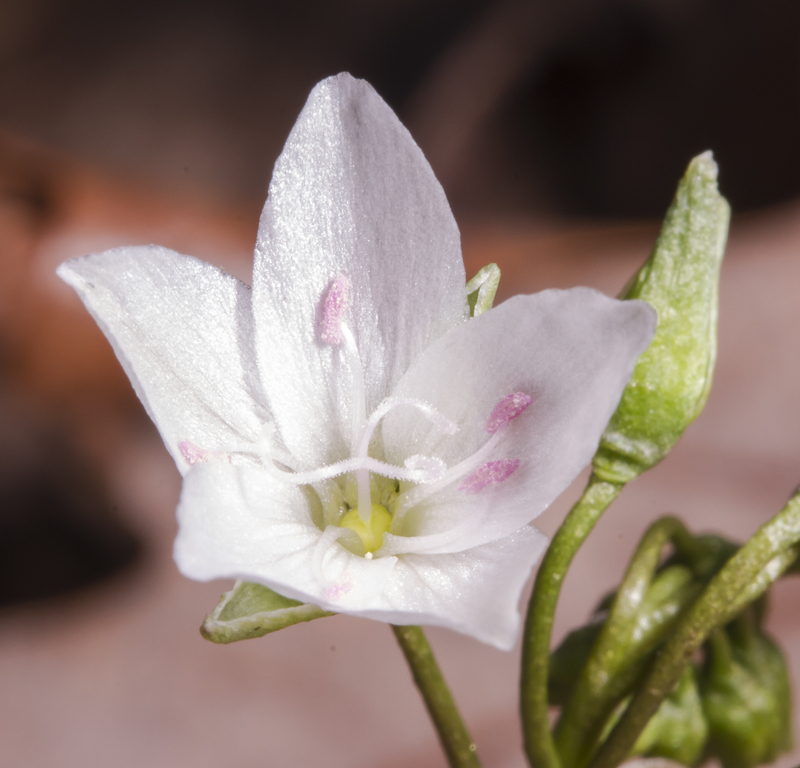 One of the earliest is one of my favorites, the diminutive Spring Beauty, Claytonia virginica. 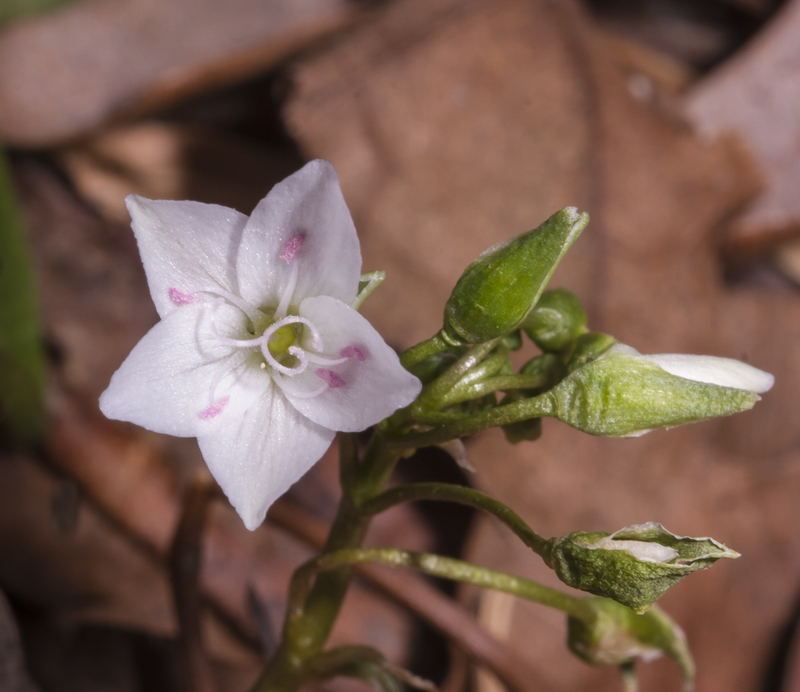 I saw this one yesterday afternoon, just barely poking its flower head above the leaf litter as I was walking through the yard. I immediately stopped and thought, it really is Spring! 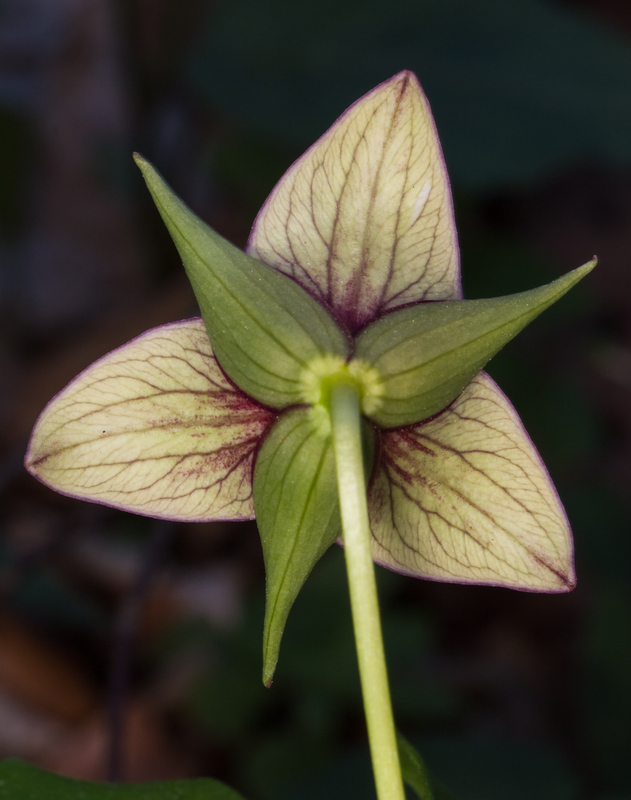 I got down on my hands and knees to take a closer look at the delicate beauty of the plants’ five petals. 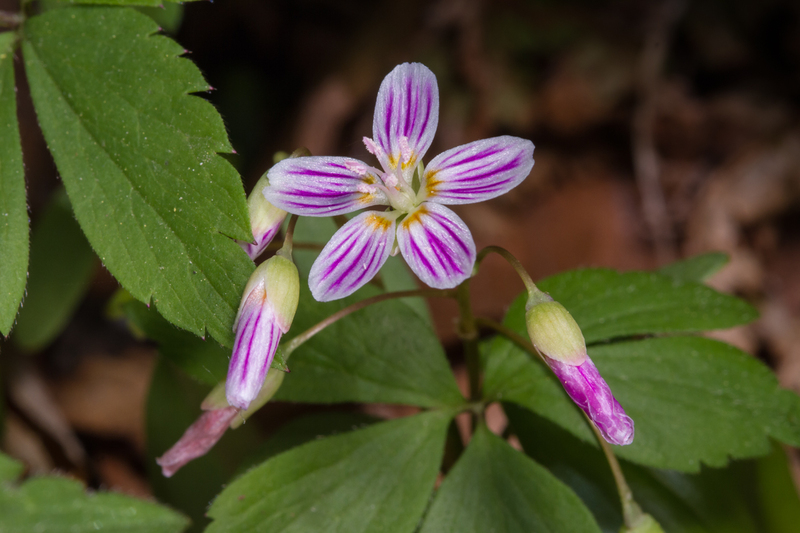 The petals can be quite variable, ranging in color from white to pink, but almost all have pinkish lines which appear to converge on the center of the flower. My flower has very faint lines, the so-called “bee guides”, which pollinators can see better than us. Research has shown that these lines on flower petals are used to guide the pollinators to the nectar when they visit a flower. A small ground-nesting bee collects the pollen from this plant and feeds it to its larvae. The aptly-named Spring Beauty Bee, and a few other species of small insects (especially a species of Bee Fly around here) are the primary pollinators. 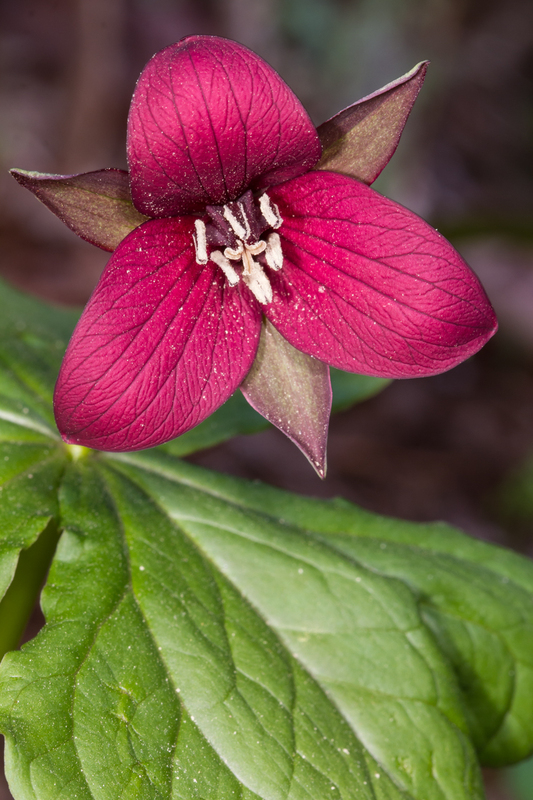 And the pollen is quite noticeable on this species of flower – it is pink. You can see the pink pollen in the pollen baskets on the legs of the Spring Beauty Bee as it goes from plant to plant on warm, sunny days. 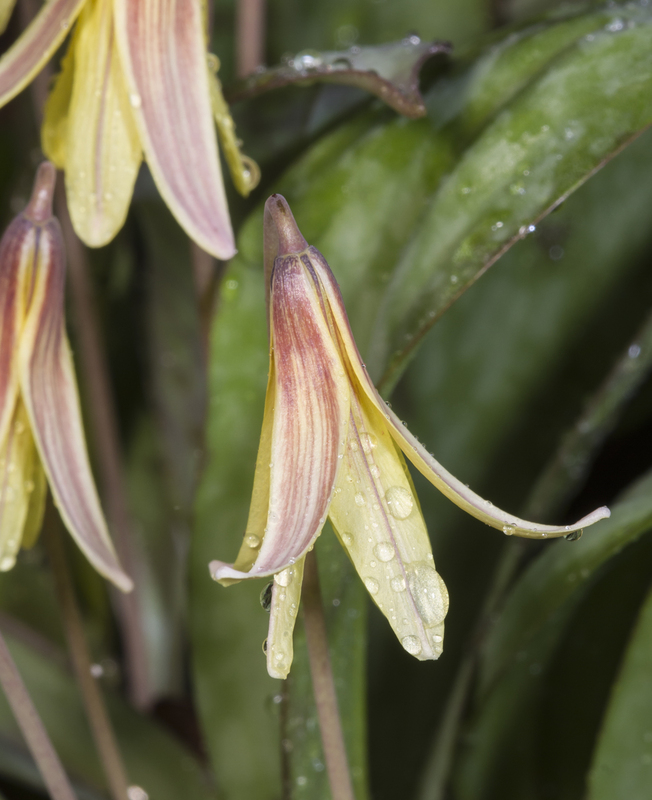 The flowers tend to open mid-morning and close by late afternoon, and may remain closed all day on cloudy or rainy days. This helps preserve the pollen to increase the chances that a bee will visit on a sunny day and cross pollinate the plant. 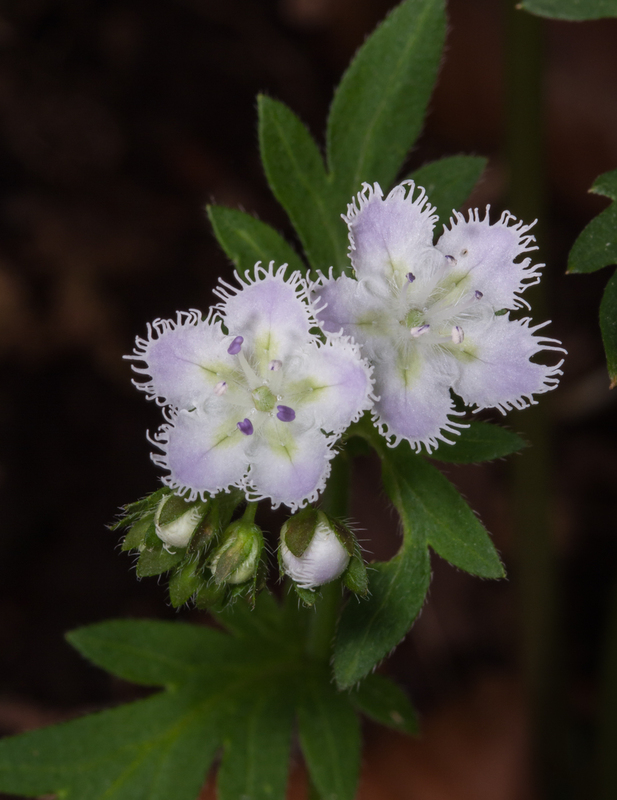 In addition to the beauty and complexity of the flowers of Spring Beauty, it also has an edible small tuber which is quite tasty to us, and a variety of wildlife. 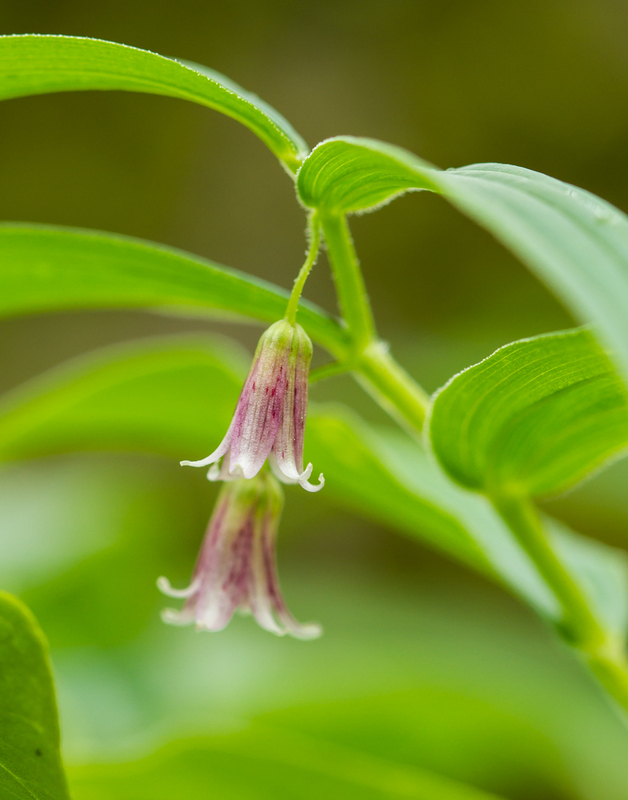 It is a great small plant for your home garden as it is deer-resistant. 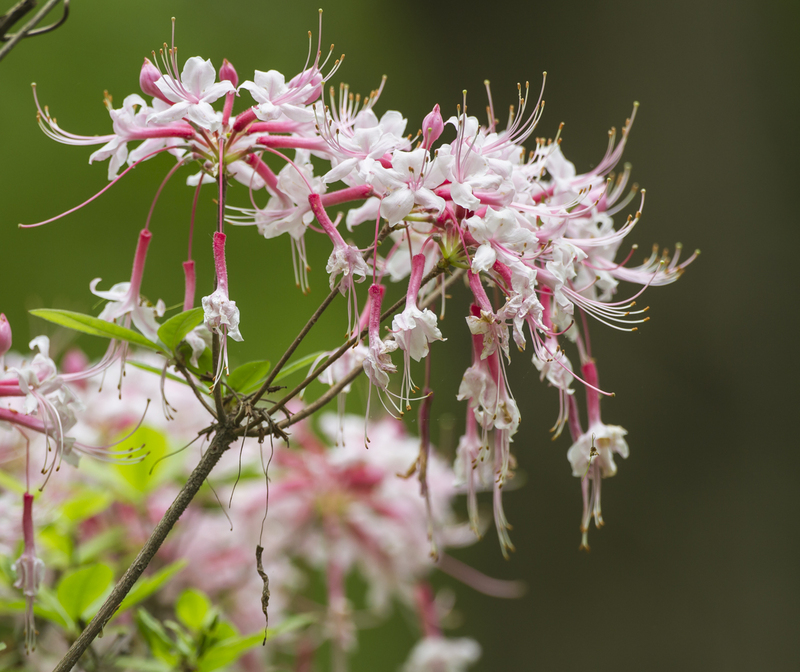 It can add a splash of color to your woodland garden for a few weeks each spring, before the whole plant goes dormant. 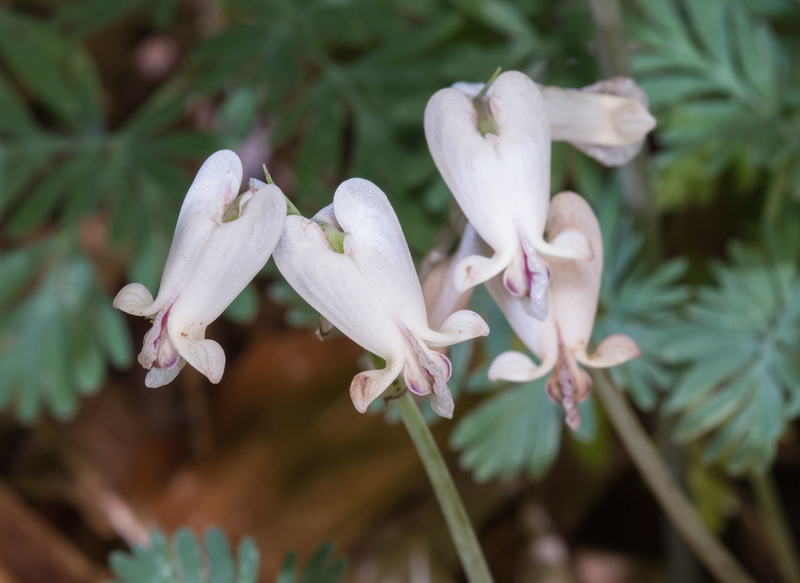 It then remains most of the year as only an underground tuber until you need another pick-me-up glimpse of a delicate spring flower after next year’s long winter. 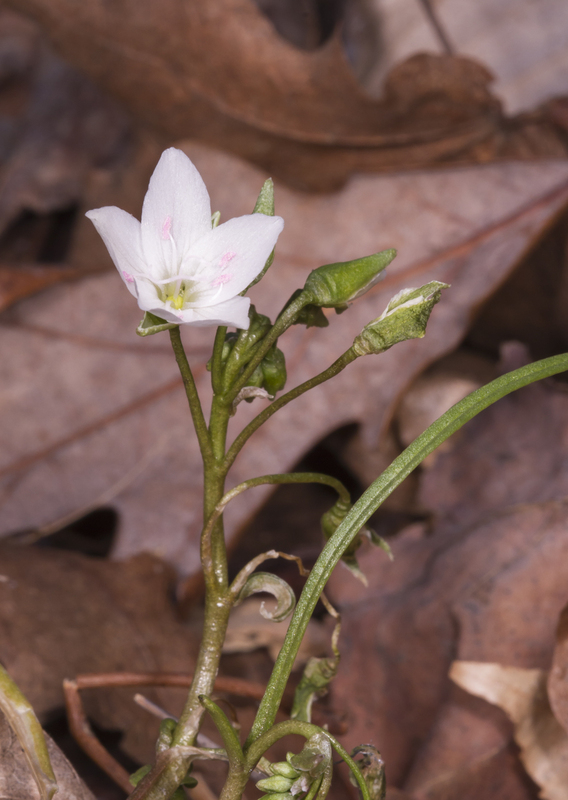 This tiny, often overlooked flower, is a perfect example of why we all need to become more aware of our native species and why we should try to plant local natives whenever possible. 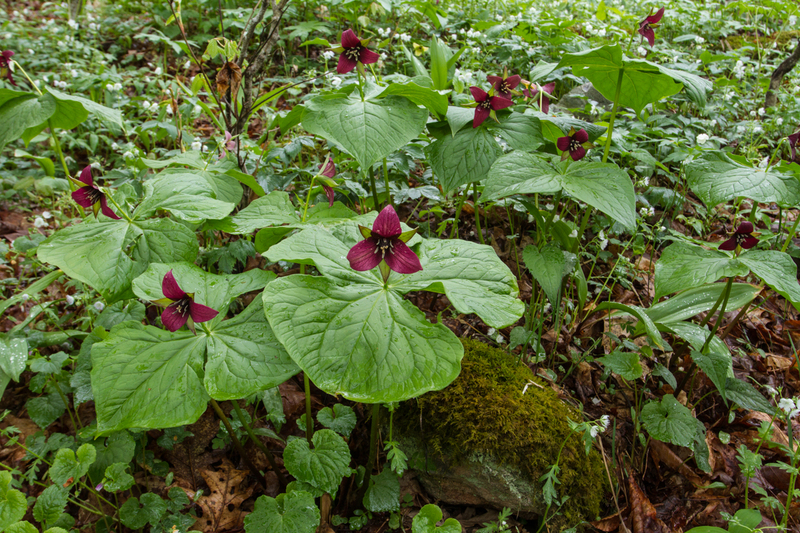 In today’s New York Times, there is a great op-ed by native plant guru, Doug Tallamy, on why natives are important, Take a look, it is a good read. 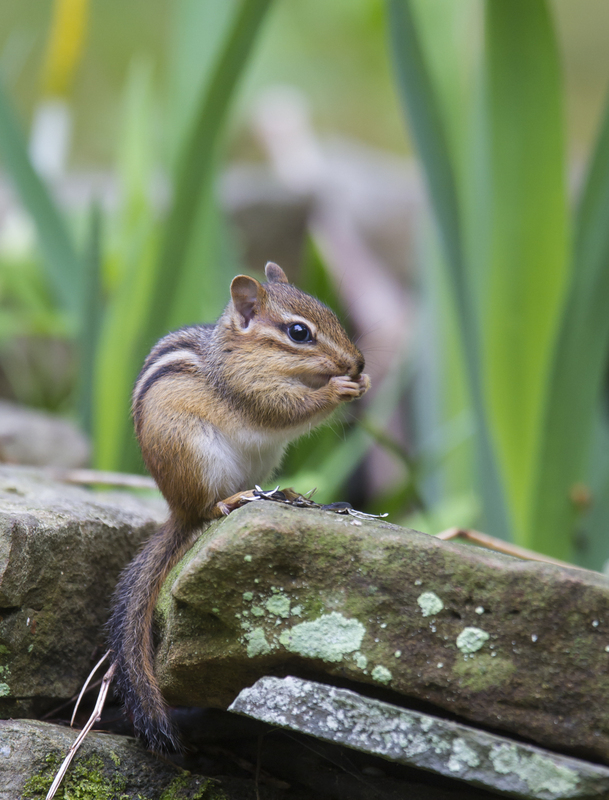 Then get outside and learn more about native plants in your area, and consider planting some for yourself, and for your local wildlife. 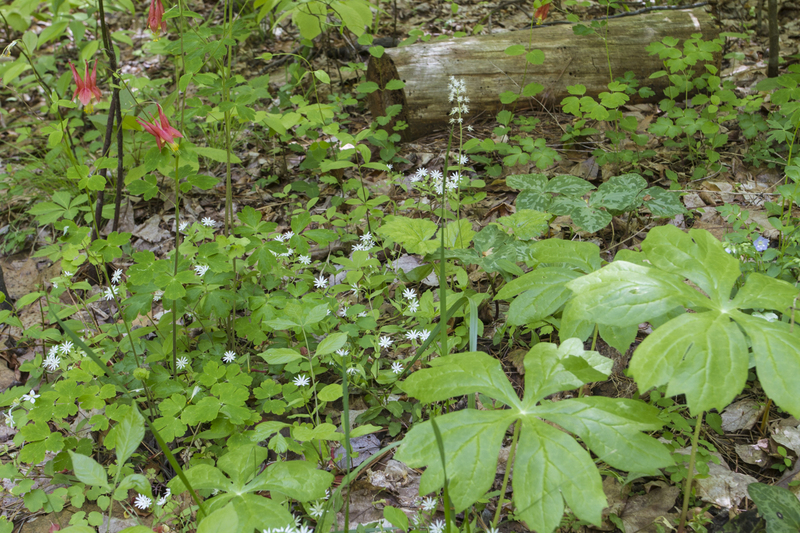 I have always had a fondness for the wildflowers of spring woodlands and have planted them in shady spots as a harbinger of my favorite season. 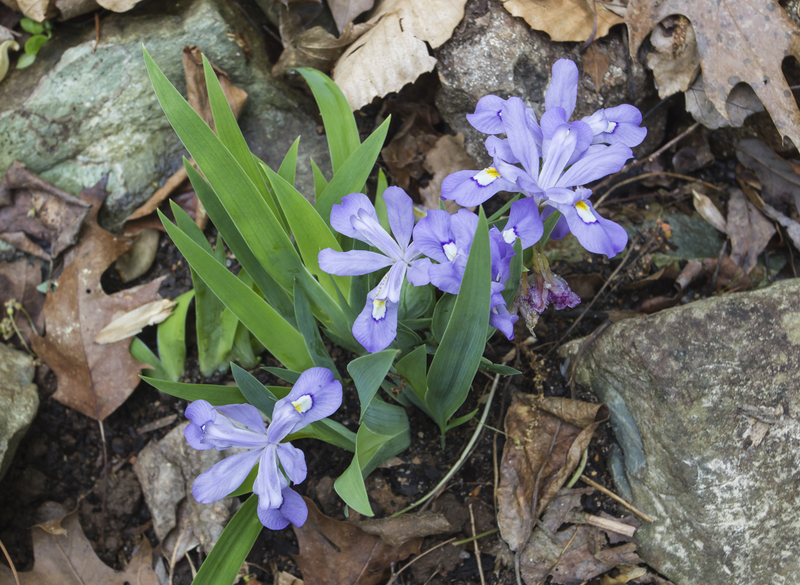 One of the hardiest of the spring ephemerals is Crested Dwarf Iris, Iris cristata. 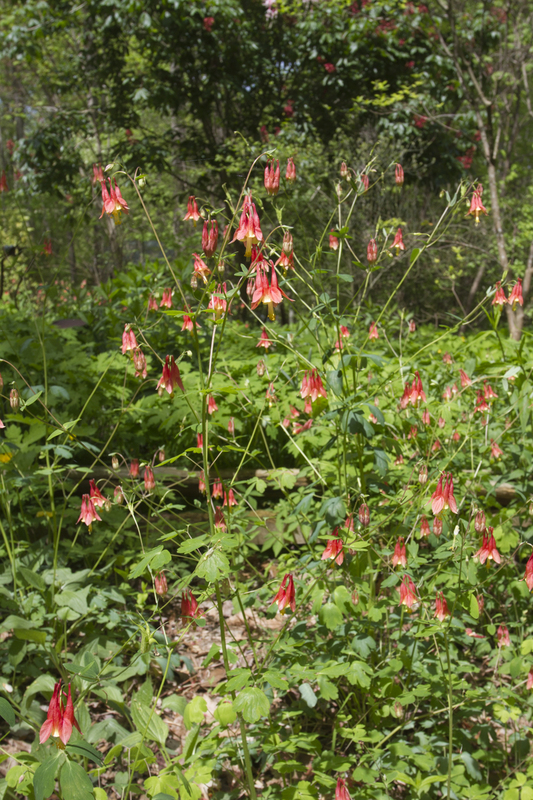 I have purchased many of these (and other native wildflowers) over the years from the NC Botanical Garden (http://ncbg.unc.edu/) in Chapel Hill. They run an honor system plant sale from April through October and usually have a large sale event in September. 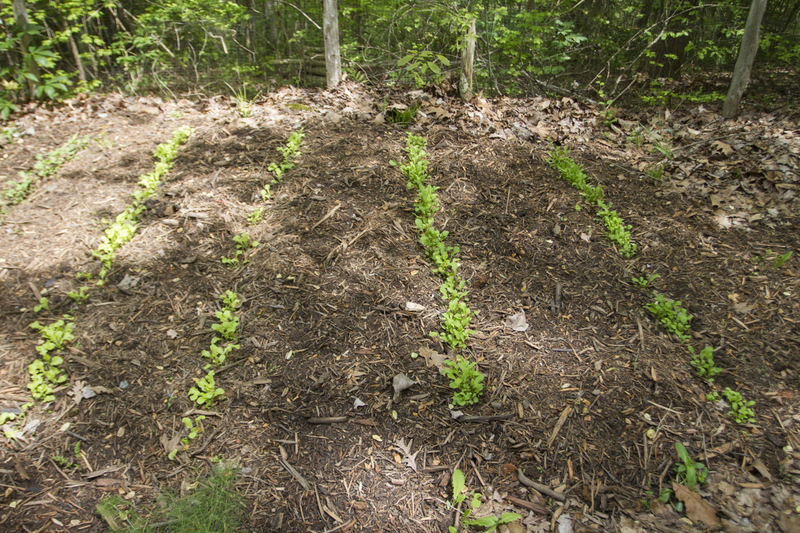 I have also transplanted some from areas that were being developed by digging a few of the stubby rhizomes and planting them in shallow soil. 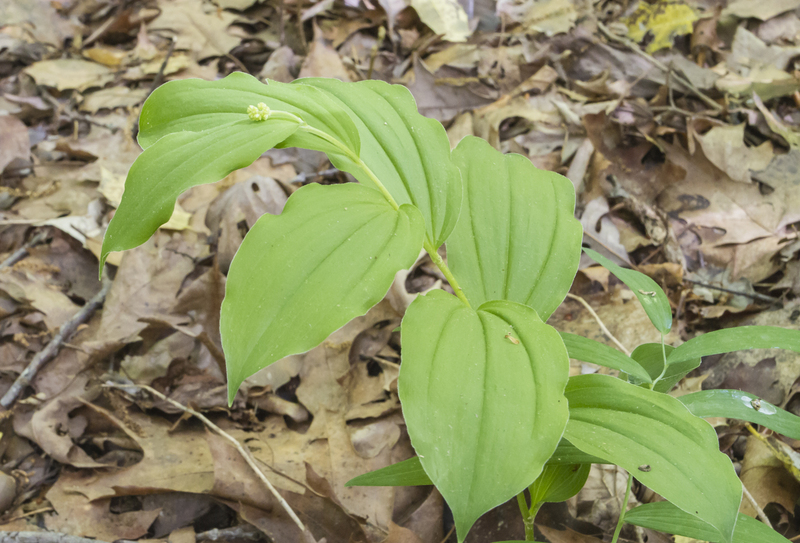 It seems these tiny plants do best on rich wooded slopes, ravines, stream banks and other places where their rhizomes remain partially exposed and the beautiful sword-shaped leaves are not covered by deep leaf litter. 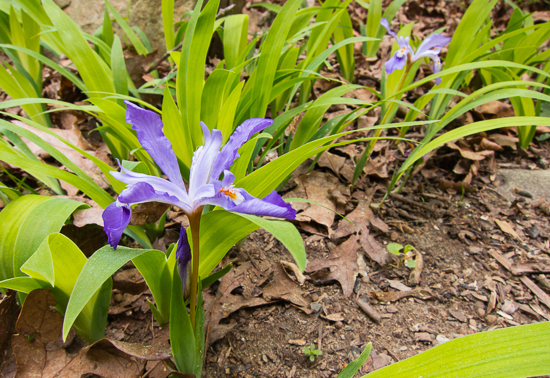 If you have typical garden varieties of iris you may do a double take when you first see this one – a tiny plant reaching only 3-5 inches in height. 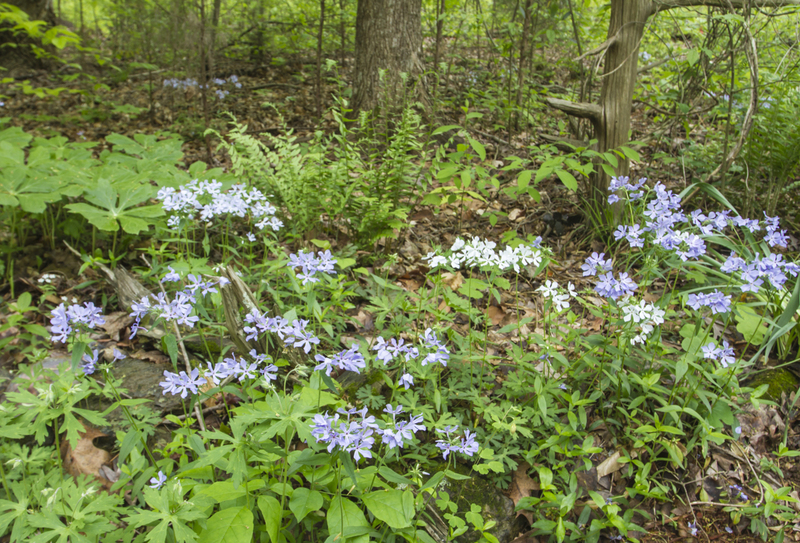 The flowers are usually some shade of blue or violet (occasionally white) and they tend to grow in patches, offering a visual delight to the spring woods walker. 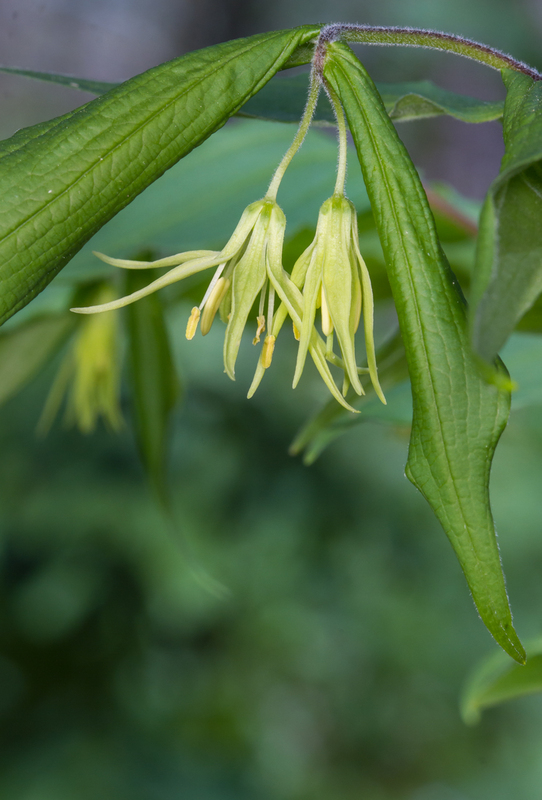 They are named for the yellow crinkled crest on the sepals, which serves to guide pollinators (mainly bees) to the nectar deep within the throat of the flower (although I have also read it may give the bee something to grasp onto while navigating toward the nectar). If you look closely at an iris, you will notice it has an unusual flower structure. 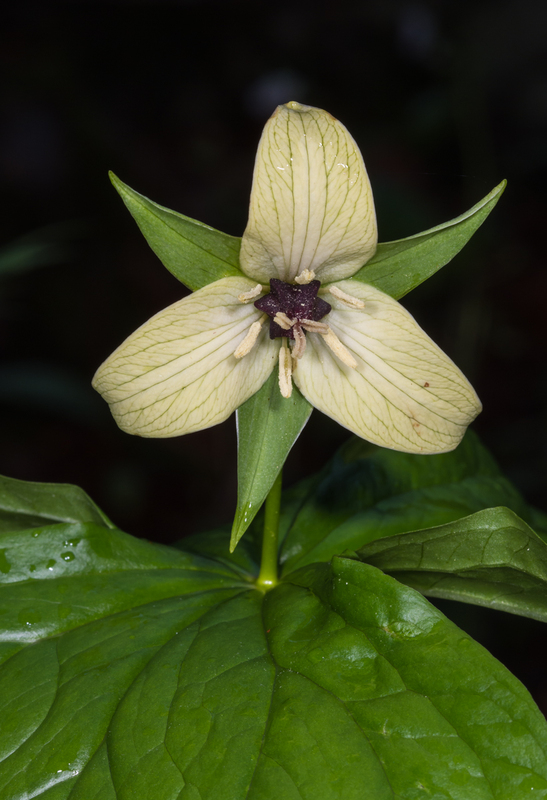 The three largest petal-like structures are actually sepals (which enclose and protect the flower bud before it opens). 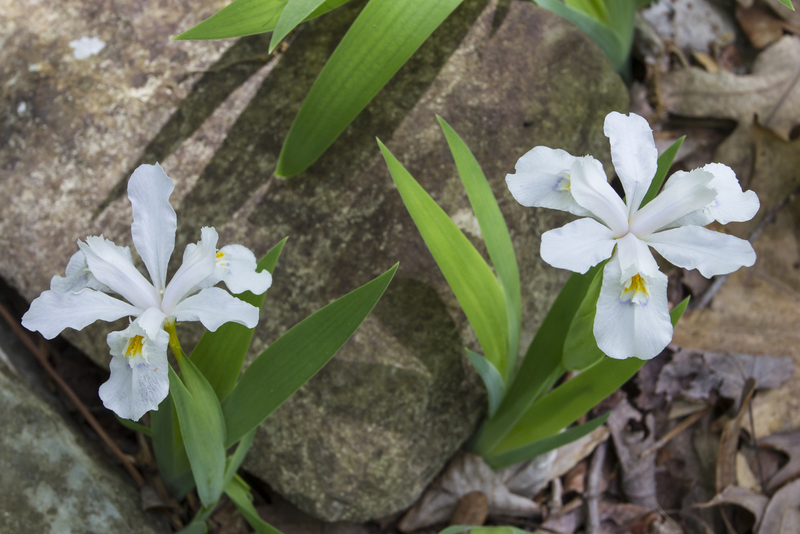 In iris flowers, they are also called the falls. The wide tip of the fall provides a place for pollinators to land. 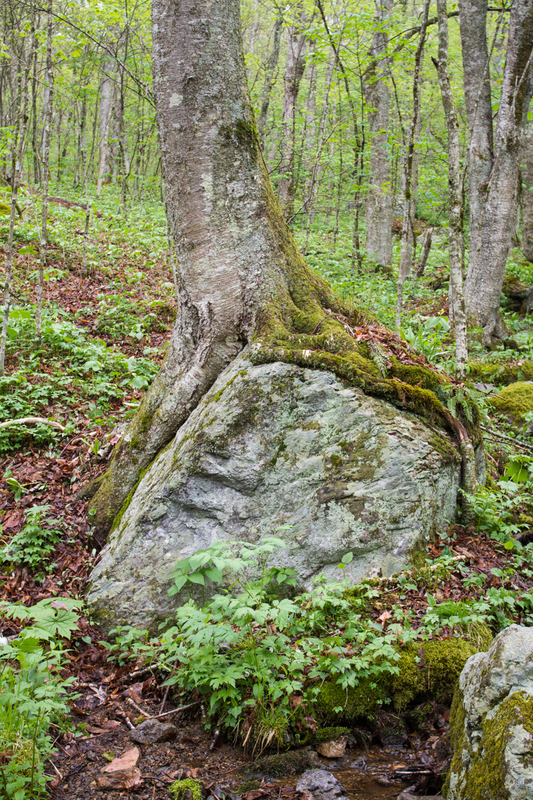 Arching over each fall is a modified reproductive part called the style arm. This is probably the most unusual part of an iris flower. 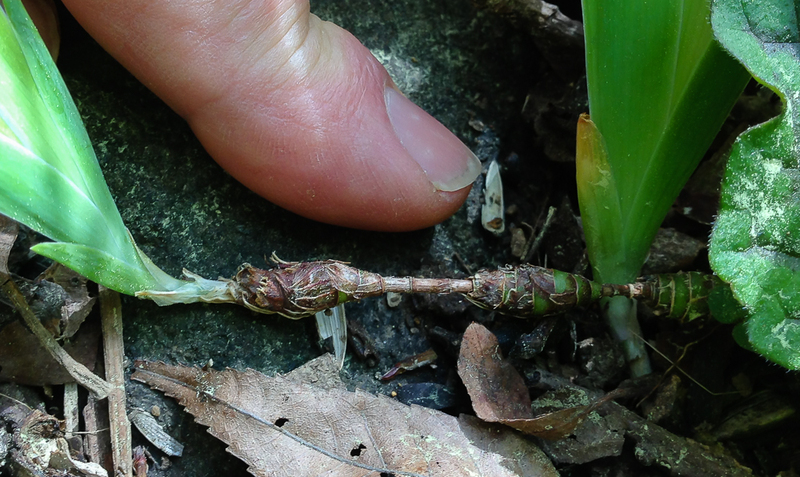 I had read about this but decided to take a closer look which required lying down and propping the flower parts open with a tiny twig to better view and photograph them (the things you have to do for science). Just under the tip of the style arm is the stigma lip. This is the area that receives the pollen. It is a light-colored exposed curved edge just under the arch. A visiting bee must push under this style arm in order to access the nectar that is deep inside the throat of the flower. While crawling down toward the nectar glands, pollen is scraped off the back of the bee by this edge and attaches to the sticky stigmatic lip. 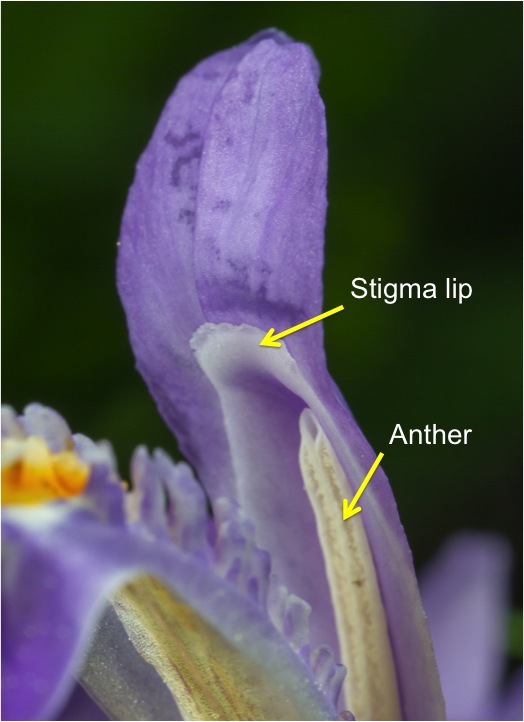 The anthers (male, pollen-producing parts) are elongate structures behind the stigma lip. After the bee gets scraped of pollen, it then brushes up against the anther and gets fresh pollen. That pollen is unlikely to be transferred to this particular stigma lip as the bee backs out (they often exit through the gap in the arch). Bees are the primary pollinators as few other insects have the strength to push under the style arm. 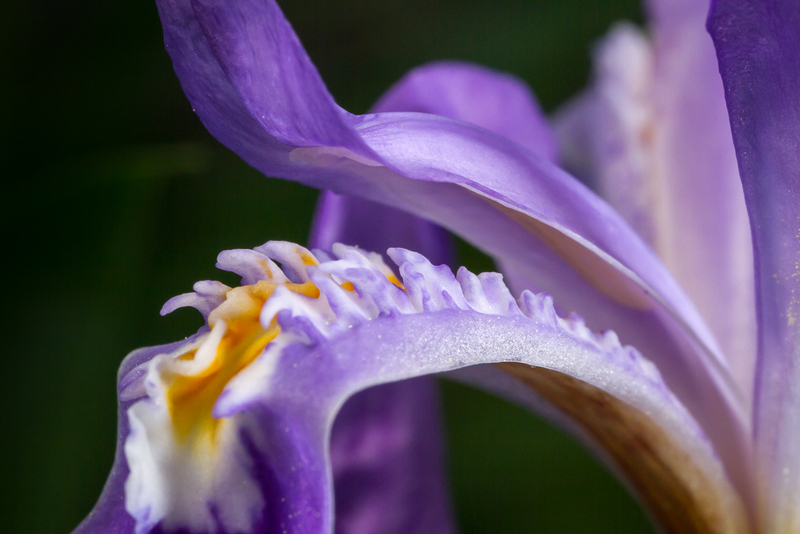 The rest of the plant parts are a bit more the usual…the true petals (often called standards in iris) are the smaller of the colorful parts, and most often stand in a more upright position than the falls. 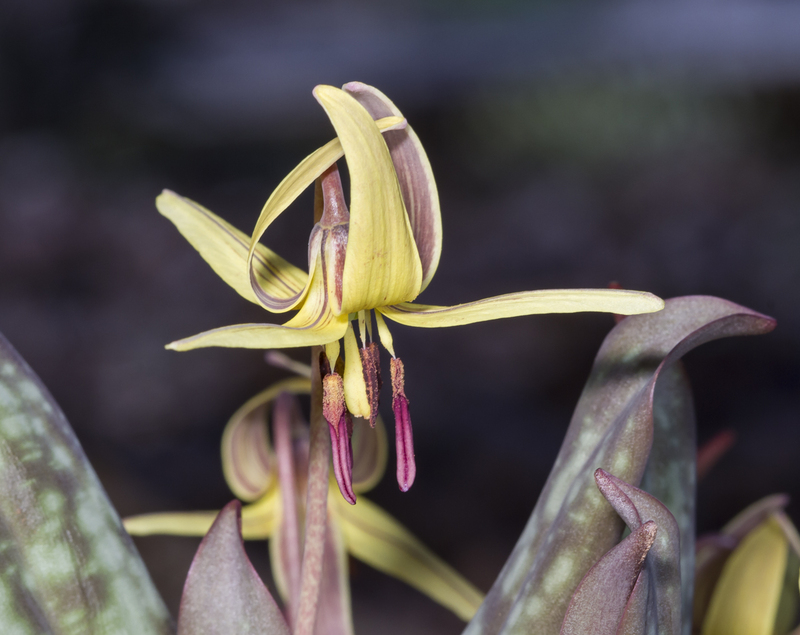 Like in most flowers, they serve to attract pollinators. The rhizomes are short and chunky and connected to one another by slender runners. 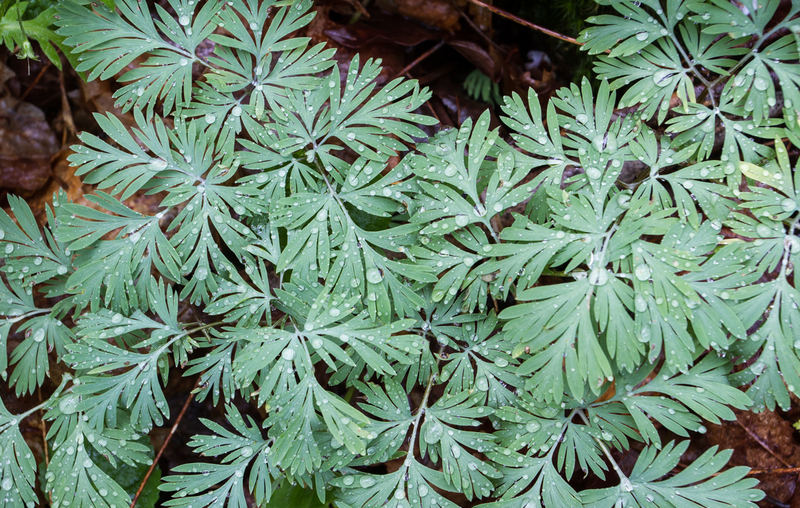 The sword-like leaves are attractive even when no flowers are present. One thing I noticed yesterday is how quickly the flower opens. 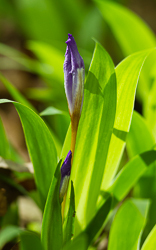 Here is a picture of the flower bud on one iris at 10:37 a.m. yesterday. When I returned from some errands at 3:00 p.m., the flower was fully opened. The modern name for the iris flower is believed to have originated in ancient Greece. There, the flower was associated with the goddess Iris, a divine messenger who traveled from heaven to earth on rainbows. Throughout history, iris have represented wisdom, faith, and courage and been used as a royal symbol of king and queens. 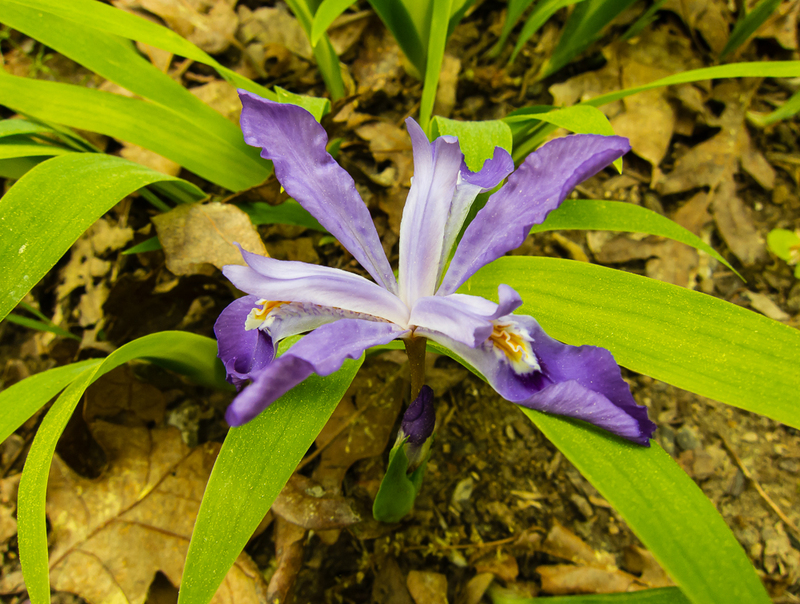 While that glory most probably went to their larger cousins, the diminutive Crested Dwarf Iris also deserves recognition and appreciation as we wander the spring woods.